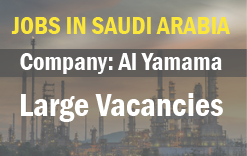 Al Yamama, One of the largest conglomerates in the Kingdom of Saudi Arabia, focused on organic growth through intuitive diversification, planning and sound business principles. The company has operated and leased out numerous projects in General contracting and construction, Roads and Bridges Works, Utilities & Infrastructure works, Facilities Management, operation and maintenance, landscaping and irrigation, Janitorial and sanitation services, Technical & Support Services. Al Yamama was established in 1952 as a Contracting and Trading firm focusing on meeting the needs of the industry. Today, it stands as a highly responsive indigenous brand in the Kingdom of Saudi Arabia, second to none in the global arena.